A Woodburytype portrait of Prince George, Duke of Cambridge, the Commander-in-Chief of the British Army. A grandson of King George III, he was first cousin to Queen Victoria. Born at Cambridge House in Hanover in 1819, he became the second Duke of Cambridge in 1850. 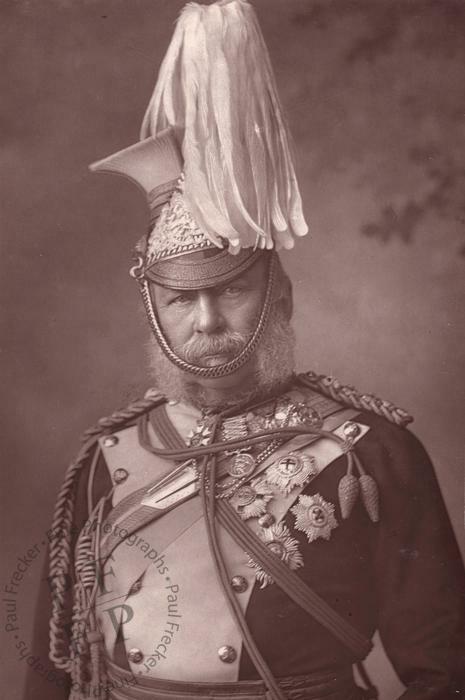 The Duke served as Commander-in-Chief of the British Army from 1856 until he was forced to retire in 1895, the longest period for which any one man has served as its head. Although he was deeply concerned about the welfare of soldiers, he earned a reputation for being resistant to change and for making promotions based upon an officer's social standing, rather than his merit. Under his command, the British Army became a moribund and stagnant institution, lagging far behind its continental counterparts. George made no secret of his view that ‘arranged marriages were doomed to failure.’ On 8 January 1847, in contravention of the Royal Marriages Act of 1772, he married privately at St John’s Clerkenwell an actress by the name of Sarah Louisa Fairbrother, daughter of the partner in a Bow Street printing firm. Since the marriage did not exist in British law, his wife was never titled Duchess of Cambridge nor styled ‘Her Royal Highness.’ Instead, she was known simply as ‘Mrs FitzGeorge.’ George was distraught when she died in 1890, and regularly marked the anniversary of her death. The Duke of Cambridge died at Gloucester House, Piccadilly, in 1904 and was buried in Kensal Green cemetery, beside the woman with whom he had shared his life. Published as a Woodburytype in 1892 as part of a series entitled The Cabinet Portrait Gallery. Condition: the Woodburytype shows a couple of small imperfections in the area of the background but is otherwise in excellent condition, as is the page on which it’s mounted. A printed caption in the lower margin identifies the sitter and the photographer’s details are also printed beneath the print. Dimensions: the print measures 5.5” by 3.7” (14 cm by 9.3 cm) and is mounted with a cream-coloured border on an off-white page measuring 9.5” by 7.6” (24.2 cm by 19.5 cm).